My dad and I are really big horror movie buffs. My mom, brother, and sister, not so much. So, when they all left for a week-long vacation, we took the opportunity to rent a bunch of horror movies. I had read “Carrie” several months ago, and I decided to add the 1976 movie version to our list. Books are always better than movies, but I liked the movie version so much, I decided on a Homemade Carrie Halloween Costume that year. 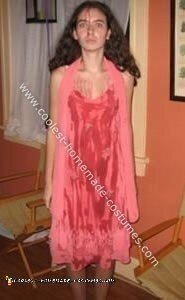 I found a recipe online on how to make fake blood (FYI, it’s red and green food coloring and corn syrup), and found a pink dress at an inexpensive store. My dad had complained that the dress was too short, but I had to explain, “Do you see how these girls dress these days, with the Ashlee, and the Lindsay, and the Paris? They all dress like strippers. It’s go ho or go home.” (quote from How I Met Your Mother). When I entered the costume contest, I was up against a guy in a bloody Scream mask. So I knew I had won. Especially when I walked very slowly down that path outside, with my eyes open wide like Sissy Spacek had done in the movie.